Advocates for indigenous communities are using new mapping tools, including geographic information science (GIS), to protect indigenous lands. Last month, ELAW Staff Scientist Dr. Meche Lu traveled to Montreal, Canada for the 2018 Indigenous Mapping Workshop, organized by the Firelight Group, to learn about new GIS tools and methods to collect and share spatial data. The workshop focused on training indigenous defenders and their allies on the latest geospatial technologies and promoting indigenous knowledge of GIS. 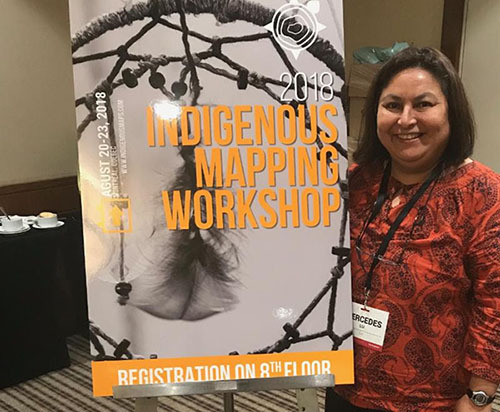 "It was inspiring to work with participants from indigenous nations, academia, and nonprofit organizations, who are using GIS tools to help communities map their traditional lands. Mapping indigenous land can be a key step in protecting those lands and cultures," says Meche. At the workshop, Meche learned about new, accessible mapping tools, including QGIS, Survey123, and ArcMap Pro, which defenders can use to create maps of their lands and communities. She will share new tools and knowledge with ELAW partners around the world, and will work with them to incorporate mapping tools in environmental and human rights cases. Many thanks to the Swift Foundation for making Meche's participation in the workshop possible.